The Bachelor of Traditional Chinese Medicine (BTCM) is a four-year undergraduate degree in the discipline of Traditional Chinese Medicine. The course provides students with a comprehensive foundation in the theory and practice of traditional Chinese medicine including acupuncture, Chinese herbal medicine, Chinese herbal dispensing, biomedical sciences, and the role of a professional Chinese medicine practitioner in the Australian healthcare system. The broad educational base of the degree, strong clinical practice focus and the development of analytical skills offered within it will equip graduates to be life-long learners and will encourage them to develop a wider professional role in healthcare. This course is approved by the Chinese Medicine Board of Australia (CMBA) in all three divisions of registration: Acupuncture, Chinese Herbal Medicine and Chinese Herbal Dispensing. The duration of BTCM is 4 years full-time. Students may choose to complete the course on a part-time basis for a maximum duration of 10 years (part-time study is not available to international students). Part-time students should consult with the Registrar. 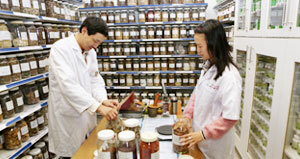 The coursework component is undertaken at the Institute’s campus located in Sydney’s CBD; students also undertake a total of 900 hours of extensive supervised clinical practice training at the Institute’s teaching clinic and at approved external clinics of registered practitioners of TCM and non-TCM professions. Students will receive approximately equal clinical training in acupuncture and in Chinese herbal medicine/dispensing. The BTCM provides students with education in the theoretical paradigms of traditional Chinese medicine including its terminology, history, theoretical orientation, principles and diagnosis. These studies will provide a firm understanding of the theory of Chinese medicine as well as develop practical skills in collecting and interpreting information in a clinical setting. the application of these therapeutic methods. Students will study classical Chinese medicine literature to provide an understanding and appreciation of the sources of many of the concepts and therapeutic approaches used in contemporary Chinese medicine. Australia, to enable practitioners to interpret the biomedical viewpoint, and to encourage the application of scientific knowledge in clinical practice. Clinical Chinese medicine studies will provide a foundation in TCM internal medicine, TCM traumatology, TCM gynaecology, TCM paediatrics and dermatology. This will provide students with theoretical and practical skills in the diagnosis, differentiation and clinical management of a wide range of health disorders using acupuncture, Chinese herbal medicine. Students will undertake Clinical Training throughout the course which includes clinical observation, clinical practicum and internship. These studies aim to provide practical training in the application of the theories of Chinese medicine and biomedicine, in the management of a wide range of health disorders using acupuncture and Chinese herbal medicine, as well as in the operation of a Chinese medicine clinic or dispensary. In an integrated manner and throughout the duration of the course, students will study professional and practice issues that include ethics, counselling and communication, the legislative framework and legal responsibilities, practice management, small business management, first aid, and research methods. This will assist students in a range of areas needed for the effective operation of an independent practice in Chinese medicine and in their ongoing professional development undertakings. This aspect of the course is integrated systematically throughout the teaching and learning process to assist in the development of appropriate interpersonal, communication and management skills to enable graduates to operate a successful private practice. Graduates will be expected to demonstrate humane and ethical behaviour in their professional life as well as respect for diversity within the wider Australian community. Graduates will be aware of the need for ongoing professional development and possess critical literature appraisal kills to enable them to undertake ongoing post-graduate education. Graduates of the course will generally enter private practice as primary practitioners and will possess knowledge and understanding of a range of modalities of Chinese medicine including acupuncture and Chinese herbal medicine. The Institute expects that some graduates will become TCM practitioners either self-employed in private practice or as a member of a team in a clinic that offers a range of therapies, some may undertake Chinese medicine research, become involved in education, product development, management and sales roles in pharmaceutical and herbal companies, provide healthcare advice and consultancy online, and some may practice in hospitals, community health centres, and other healthcare agencies. As primary healthcare practitioners, graduates will be competent in the practice of Chinese medicine and conversant with the legal responsibilities, ethics, and standards of Australian health professions generally. Graduates will be familiar with the Australian healthcare system in order to make appropriate referrals and to use that system in the interests of their patients. Applicants who have completed post-secondary studies may request consideration for advanced standing towards the BTCM. Applications for credit should include full documentation of previous studies, including unit descriptions. Granting advanced standing for previous study ensures that students commence study at a level that appropriately recognises their prior learning experiences, and are not required to repeat equivalent learning successfully undertaken in another context. For more information and an application form for advanced standing please contact the Institute.